Home > Agile Coach > Should You Centralize Your Agile Coaching? A few months back, I wrote an article for Tom Cagley’s blog titled, Why an Agile Center of Excellence is a Really Bad Idea. Though well received, it seems like my perspective may have missed the boat. Shortly after my article was posted, Gene Gendel reached out to me. I’ve known Gene as an Agile enthusiast and NYC agile instigator since 2012. Gene is an Agile Coach and Trainer, and has been certified by the Scrum Alliance as a Certified Enterprise Coach. 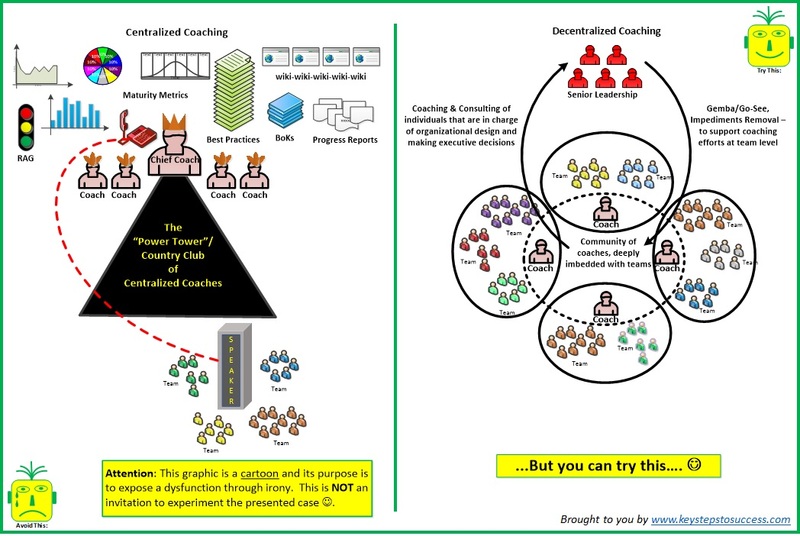 Gene pointed out to me that what I wrote was very similar to an article he wrote for InfoQ about centralized vs. decentralized coaching. While our posts were similar and came to parallel conclusions, we came at it from different perspectives. Gene’s point was not so much about the label “CoE” as it was about the agile coaching position in the organization. Like my post about agile expertise, Gene felt that agile coaching should not be centrally located in one group. Instead, they should be decentralized and located as close as possible to the teams. He believes that the focus or mission of the coaches should not change, they just should be positioned and aligned with the teams they are serving. The coaches should not be centrally located. Here are a few other things Gene and I agreed on in our articles. Those people in the coaching or community of practice should not be displaced managers or career bureaucrats who don’t really understand agile. Standardizing on a single set of ‘Best Practices’ for agile is a really bad idea. Rather than prescribing the one best way, teach and provide guidance and encourage teams to come up with their own best approach. Organizations should avoid hiring low quality agile transformation consultants, or quasi coach “centaurs” as Gene calls them. I encourage you to explore Gene’s great article on this topic. Gene also presented this topic at a recent LeSS Conference in New York and has shared his slides from that presentation. In fact, all his writing is on point and I for one appreciate his bias toward deep thinking, and descaling approaches like LeSS. I encourage you to explore his other writing at Key Steps to Success. Gene also created the cartoon below to summarize his post. It is a much more detailed vision of centralized vs. decentralized and my own image at the top of this post. You can see more of his entertaining and thought provoking cartoons on his site here. I hope you enjoy these two complimentary articles. As always, I invite you to weigh in with your comments.